Yigal Landau: "The increased disappointments"
According to an article published by Globes, the estimate of total reserves in the Leviathan gas field was increased from 21 TCF (trillion cubic feet) to 24 TCF. Increases were reported in proven natural gas reserves and the volume of total reserves rose. The partners were also updated on an increase of 54%, to 34 million barrels of condensate. Condensate is a liquid obtained during the gas production process and is used as a raw material in the petrochemical industry. Condensate prices are several times higher than the price of natural gas, according to the article. 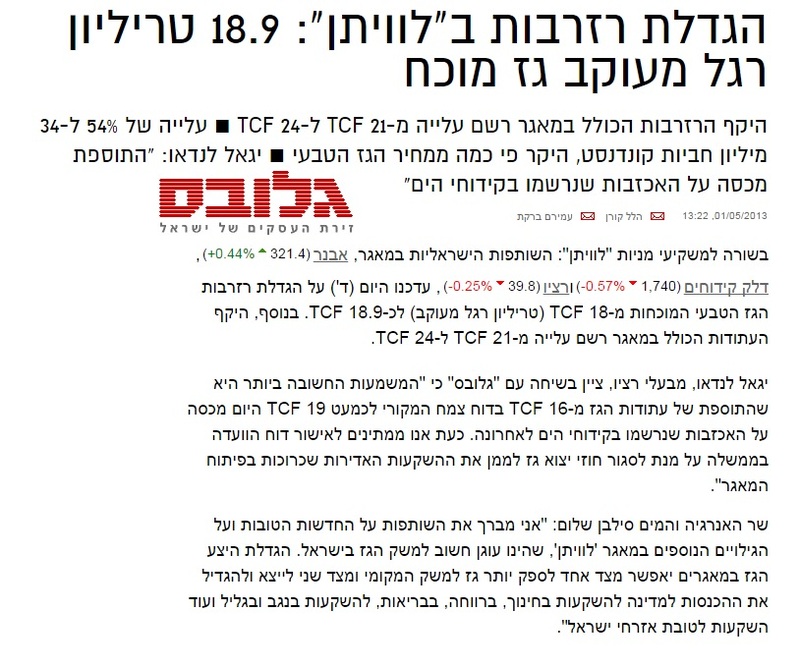 Ratio CEO Yigal Landau noted during an interview with Globes that the most important significance is that the increase of gas reserves from 16 TCF to nearly 19 TCF compensates for the disappointments recently announced during recent sea drilling. Yigal Landau added that for the time being they are waiting for the approval of the report of a government committee in order to reach export gas sales contracts that will allow the financing of the investment needed for the development of the field. Energy and Water Minister Silvan Shalom said that he congratulated the partners on the good news and for the increase in the reserves. He added that increasing the gas reserves will on the one hand provide more gas to the local market and on the other hand increase the gas exports and the revenue to the state for investment in education, welfare, health, investments in the Negev and Galilee and more for the benefit of the Israeli people. This entry was posted in In the Media, Oil and Gas Exploration and tagged drilling, Globes, Leviathan reservoir, reserves, Yigal Landau. Bookmark the permalink.